The EEOC expects the expanded date from the EEO-1 Report to improve its investigations into pay discrimination based on gender, race and ethnicity. On Sep. 29, 2016, the U.S. Equal Employment Opportunity Commission (EEOC) released a revised EEO-1 Report—also called the EEO-1 Survey—that includes the requirements to collect summary pay data from certain employers. 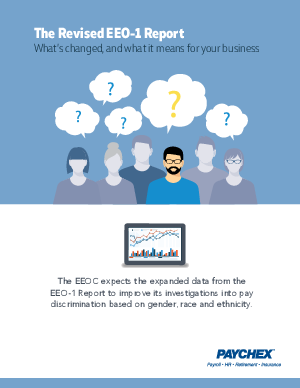 The EEOC expects the expanded data from EEO-1 Report to improve its investigations into pay discrimination based on gender, race and ethnicity. So, what does this mean for your business? Let’s find out…download our free report today!